Your now 6.46 inches long baby has real nails at this point. Although, they are not quite the same as ours nails yet. They are much softer and comparable to thin membranes. They will remain so for the first weeks after birth. That is why you are told not to cut a baby’s nails in that period. You will probably have the 20-week ultrasound this week. This is a medical ultrasound, not just for fun. It looks at how your baby is growing, the placenta, and whether there are any abnormalities such as a cleft lip, clubfoot or open back (Spina Bifida). It is also possible to see your baby’s gender during this ultrasound. Say in advance whether you want to know the gender. No one can predict the exact day you will feel your baby for the first time. Some will have felt their baby a few weeks ago (often those who have been pregnant before) and others will still have to be patient. But this week is when many women say they feel their baby for the first time. And what a milestone! You may feel a little uncomfortable when you feel your baby because you don’t actually feel their limbs but only the effects of their movements. Your baby still has so much room that it doesn’t touch the womb or the abdominal wall. When baby moves, a lot of amniotic fluid shifts around, and that’s what you can feel. In the beginning it feels a bit like a rumbling tummy. Many women describe it as a butterfly flapping around in their belly. 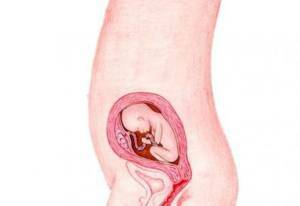 What is Amniotic Fluid made of? Your belly has grown considerably by now. Your belly button may have ‘popped out’, so you have a bump instead of a belly button. Don’t worry, it will go back to normal after the delivery.